WOKIEE WooCommerce Theme is more than usual theme. It is a powerful design tool. WOKIEE is outstanding Premium WooCommerce theme. It will be perfect solution for your current or future webshop. It has all required tools and modules to create super fast responsive website with amazing UX. Great variety of numerous layouts and styles allows to create different structures and satisfies any specific requirements. Everything you need is in WordPress CMS. You can avoid expensive web development and minimize your design costs using Premium WooCommerce theme WOKIEE. Gain full control over your entire website through your own Content Management System that lets you change the navigation, site content, images, products, collections and so much more. 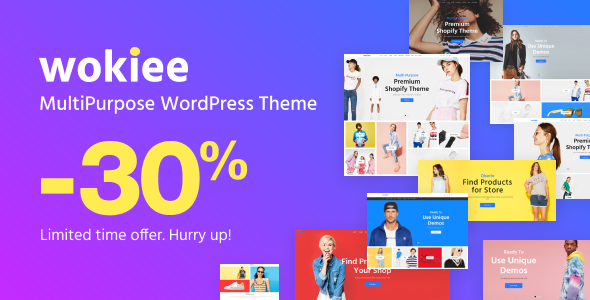 Premium WooCommerce Theme Wokiee is the best choice for your store! Our default color is blue. But it can be easily changed to some other. As you can see from our demo, we have different color schemes. This feature is also presented in our Shopify theme. You can align content according to your specific localization. Our demo is presented in 6 different languages. Of course Shopify is Multilanguage software and you can have your own localization. Mailchimp is our choice. It is easy in use and adjusting, checked by millions of the customers. Our source package contains presets for each layout. You can install any skin by copy/pasting predefined structures. Differetn Stunning Layouts with various color scheme and different content blocks. We provide 4 layouts for the most important page of your site. You guessed it correct. The Product Page. The page that shows all of your product, Shop Page. We have 6 of them and all of them are equally awesome. We provide numerous variation in our header that will surely meet your need. If not, contact us we will try to add that too. We provide 4 Footer combinations in this theme. Our provided Megamenu is so much convenient that will surely meet your desire. We provided very easily editable Banner Section that will give you the best flexibility. It is a e-commerce theme and that is why we provided apecial attention in Color, Size and Material Swatches.